Considering that Hillary Clinton's use of a private email server required massive investigations and contributed to her failure to win the electoral college, it's ironic that Donald Trump's blatant and unprecedented conflicts of interest and his clear ties to Russia are no cause for concern for Congressional Republicans who have repeatedly ignored requests for an investigation on both counts. So last Thursday, Rep. Jerry Nadler (D-NY) resorted to a little-used legislative tool to force either a committee debate or a full House vote on this issue. Nadler filed a "resolution of inquiry" asking our new attorney general, Jeff Sessions (sigh) to provide copies of everything that pertains to any criminal or counterintelligence investigation into Trump. Now they'll either they'll have to launch an investigation or the GOP will have to go on record as saying they do not believe one is needed - which should provide excellent fodder for their opponents' campaigns in the upcoming midterm elections. 1. 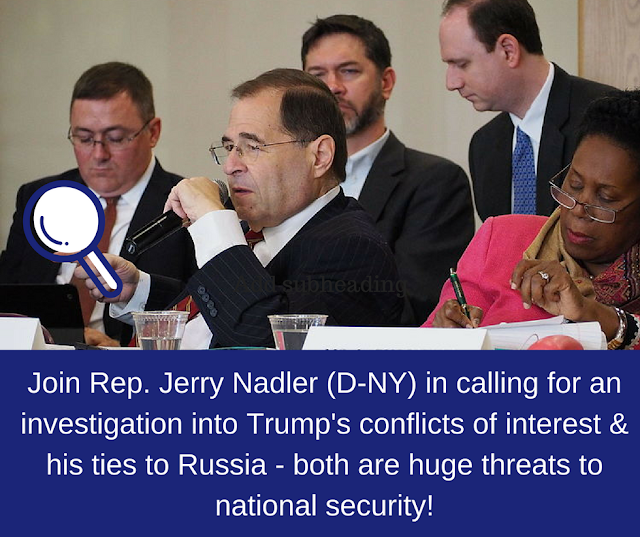 Thank Rep. Nadler for pushing for an investigation of Trump's conflicts of interest and ties to Russia. Here's your script: "Hi, my name is NAME and I'm calling from TOWN/CITY/STATE. I don't need a response, I just wanted to tell Rep. Nadler how grateful I am for the leadership he's showing in calling for an investigation into President Trump's conflicts of interest and his ties to Russia. Thank you so much." Twitter is: https://twitter.com/RepJerryNadler My tweet is below in case it's helpful. 2. Urge Rep. Bob Goodlatte (R-VA), the chair of the House Judiciary committee to launch an investigation per Nadler's request. Here's your script: "Hi, my name is NAME and I'm calling to urge Rep. Goodlate committee to launch an investigation into President Trump's unprecedented conflicts of interest and his ties to Russia without further delay. This is not a partisan issue, it's a matter of dire national security that requires immediate attention. Thank you for taking the time to pass along my comments." They'll probably ask where you're calling from - you can just say you're not a constituent but are calling with regards to the Representative's role as Chairman of the Judiciary committee. Twitter is: https://twitter.com/repgoodlatte My tweet is below in case it's helpful. @RepGoodlatte you MUST launch a full investigation into Trump's conflicts of interest & ties to Russia. It's a matter of national security. 3. Contact the House Judiciary Committee to urge the same. Phone number is: (202) 225-3951 (I got through on the first try on Friday morning). Here's your script: "Hi, my name is NAME and I'm calling from TOWN/CITY/STATE to urge the committee to launch an investigation into President Trump's unprecedented conflicts of interest and his ties to Russia without further delay. This is not a partisan issue, it's a matter of dire national security that requires immediate attention. I am very grateful to Rep. Nadler for his leadership on this topic and urge the committee to act ASAP. Thank you for taking the time to pass along my comments." Twitter is: https://twitter.com/HouseJudiciary My tweet is below in case it's helpful. If you'd like to read more, here are some articles about this development.